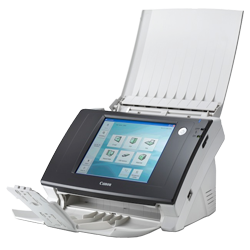 Canon ScanFront 300 Scanner The network-ready ScanFront 300 lets you share your work safely and securely in a few simple steps. Also features Canon’s advanced CMOS contact image sensor technology for dazzling image quality. 8.4" SVGA liquid crystal display: Wider view of scanned documents. Directly route documents to E-mail, PC shared folder, FTP server, USB drive, Fax and Printer. Device Authorization: Key-in & list-type login. Saved and pre-configured information: Address book and Scan-To-Job buttons. Program Restrictions: Using the Administration Tool.